Lacey has been married to Al White since 1993. They have two sons: Lee and Luke. Lacey & Al both grew up in Columbia, TN and Lacey graduated from The University of Tennessee with a degree in Retail and Consumer Science in 1992. After their marriage, Lacey & Al settled in Alabaster, AL. 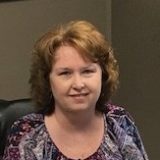 In 1998, after working for Parisian and then Jan’s Card Shops, Lacey went to work for Riverside Baptist Church in Helena, AL as a full-time secretary. When Lee was born in 2000, Lacey worked part-time as the financial secretary for Riverside and then CrossBridge Community Church until they relocated to Albertville in September of 2009. Lacey started volunteering in the church office in 2012 and in January of 2017, she was hired as the church’s secretary.